A great feature of Inline Design’s products is their ability to be mixed and matched for any kind of customer preferences. Dean, from San Francisco, took full advantage of this feature when crafting the perfect railing for his deck overlooking the gorgeous cityscape. 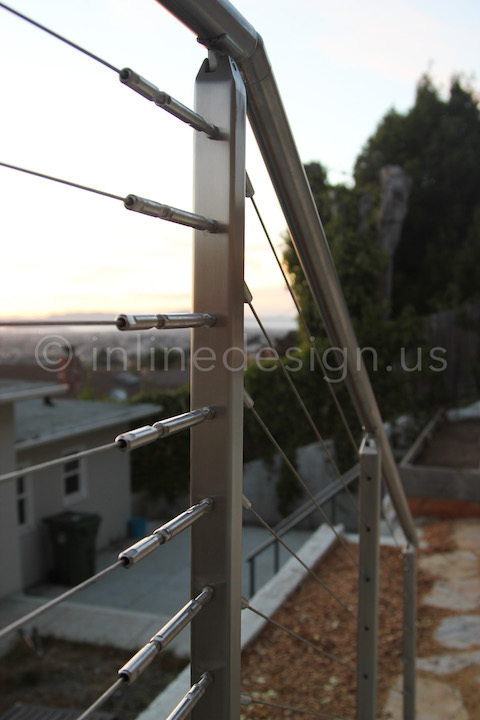 Dean went with the Press and Latch Cable Railing System with a square profile. This square profile was mixed with a round handrail on top, making for a unique yet sleek and stylish aesthetic. In addition to the ability to mix-and-match, the Press and Latch Cable Railing System comes with many other positive features, including two different mounting types (side (fascia) mount, or top mount) and two different cable sizes (1/8” and 5/32”). The material is stainless steel 316 Marine Grade, which requires very simple maintenance and is corrosion-resistant. The most appealing part, however, is that the Press and Latch doesn’t require any special tools, which saves up to 80% in installation time. It’s no wonder Dean chose this for his deck. San Francisco is a beautiful city, and Dean has a lovely view of its sunsets from his deck. It would be a shame to obstruct this colorful view, and cable railing does anything, but. Dean’s process with Inline Design began in June of 2018, communicating back and forth about design ideas and installation advice. While some customers opt. to have a professional installer for their project, Dean had eyes set on installing his railing himself. The great thing about the Press and Latch Cable System in particular, is that it is simple to install yourself, as long as you know what you are doing. As mentioned above, the Press and Latch Cable System saves up to 80% in installation time, and Dean’s timeframe shows this off well. It was a decently sized project, and the project was culminated by the end of August. Dean’s final project came together beautifully, highlighting his home’s exterior features and its surrounding natural features, as well. Residents and guests are sure to enjoy this deck for many years to come, all thanks to the Press and Latch Cable Railing System. Between the communication, advice, and product itself, Dean praised Inlined Design of being “quite deserving of a high rating.” We are delighted when customers are happy, and projects come together as nicely as Dean’s did.